The pictured tape in hair extensions is Hera 14 inches #8 medium color curly Malaysian hand tied PU skin weft hair extensions, which is also called hand tied tape in hair extensions, because the hair is hand tied to transparent PU. Normally speaking, we do 1.1 cm PU height but we can do the PU height from 0.7cm -1.5cm as your like. Hera is the best hand tied PU skin weft hair manufactuer and wholesaler in China, which Hera can supply three kinds of tape in hair extensins, regular glue tape in hair extensions, hand tied tape in hair extensions and double needle tape in hair extensions. If you want light color hand tied PU skin weft hair, we recommend you choose virgin hair, such as Indian virgin hair, Chinese virgin hair, Brazilian virgin hair, European virgin hair, Mongolian virgin hair, Malaysian virgin hair etc. If you are doing tape in hair extensions wholesale business, or runing hair store or runing hair salon or even you are self-employed hair stylist, Hera welcome you contact us for wholesale hand tied PU skin weft extensions. Hera can supply aboved kinds of hair materials hand tied skin weft hair extensions, double needle tape in hair extensions and glue tape in hair extensions. Our tape in hair extensions wholesale MOQ is only 10pcs, which our tape in hair extensions is good ratio single drawn hair. We also can produce the hand tied PU skin weft hair extensions according to your special requirement, such as different PU height, different hair ratio and any hair texture according to your market special requirement. 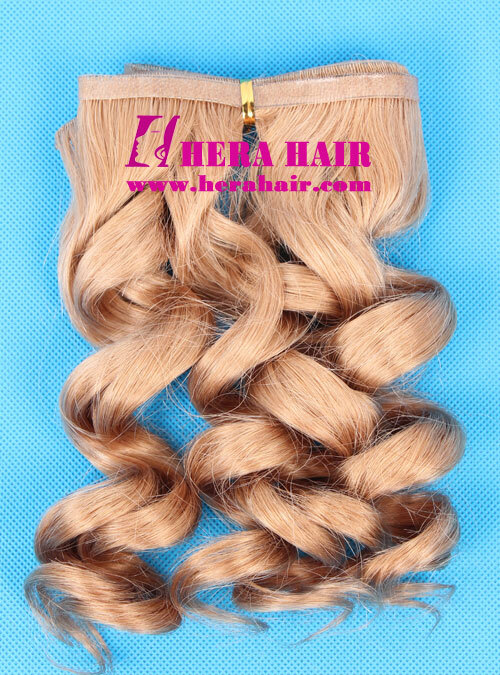 If you are personal hand tied PU skin weft hair extensions buyer or hair stylist, hair salon owner to buy several packs for your clients, you could visit our online Hera Hair Extension Store, which any tape in hair extensions order is free shipping to worldwide and you can pay by Paypal. No matter you want to wholesale hand tied PU skin weft hair extensions or want to enquiry about Hera's tape in hair extensions, we recommend you contact us by Email, which email could describe your order details very clearly and we can tractk the records in future.